Format: 13 x 5’ + 1 x 30’ + interactive Internet version. Target: Children from 3 to 5 years. GENRE: Animation. A single story told in a different cinematic style in each episode. 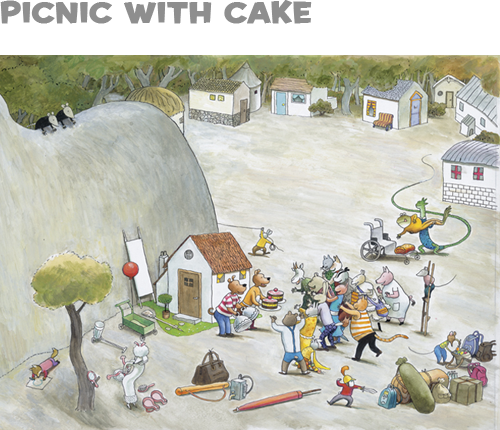 CONCEPT: Animals from a tiny village face a huge collective challenge: to take everyone on a picnic! It won’t be easy, because all the animals are different, and sometimes their ideas clash. Will they manage to work things out and enjoy the pies? Picnic with cake is an animated TV series and multiplatform adaptation of the well-known picture books Picknick met Taart and Waar is de Taart? by Thé Tjong-Khing.